MetaTrader 4 iOS is a full-fledged trading app for iOS powered mobile devices.MetaTrader 4 iPhone (MetaTrader 4 iPad) is able to impress any trader by its broad capabilities.Fully functional Forex trading, efficient arsenal of the most critical technical analysis tools (30 technical indicators) and ease of use in everyday activities - all these features are available in MT4 iPhone (MT4 iPad).So, MT4 iOS app offers all you need for successful Forex Trading.You can easily access financial markets from anywhere in the world, at any time and for free. 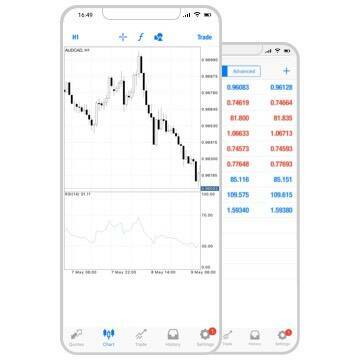 Such possibilities are now available with MetaTrader 4 iPhone. No compromises are tolerated! MT4 iOS is compatible with iPhone, iPod touch and iPad. MetaTrader 4 iOS requires a smartphone or tablet PC powered by iOS 4.0 or later. In the appeared window in the upper right corner press the "+" button. In the new window choose "Login with existing account"
Enter the login and password, press the "Sign in" button in the upper right corner of the window. Press "Home" button when application is removed.